The day after watching the German team take away the World Cup, Brazil’s President Dilma Rousseff headed northeast to Fortaleza, Ceará, for the Sixth Summit of Heads of State of the BRICS group: Brazil, Russia, India, China, and South Africa. 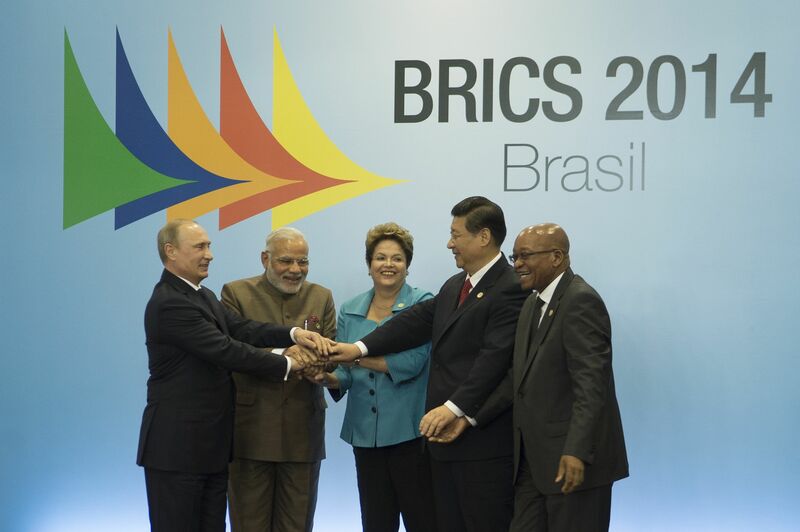 Since their inaugural summit in Russia on 16 June 2009, BRICS leaders have met annually to pursue their common goals for peace, security, development, and cooperation. Working within the framework of the United Nations, they continue to push for financial stability, sustainable growth, and quality jobs – globally and nationally. They also called for a comprehensive reform of the United Nations. With greater representation on the Security Council, they seek to ensure better response to global threats. In my view, the greatest accomplishment at this Summit is their signed agreement establishing the New Development Bank, “with the purpose of mobilizing resources for infrastructure and sustainable development projects in BRICS and other emerging and developing economies.” This is good news for struggling Caribbean nations (see article by Sir Ronald Saunders). Will this move bring about needed reforms in the IMF and World Bank? We shall see. Another important development is the signed Treaty for the establishment of the BRICS Contingency Reserve Arrangement. With an initial US$100 billion, this reserve fund aims to strengthen the existing global financial safety net. Will the casino-style, transnational financial institutions infiltrate or undermine this new support system? After signing the Fortaleza Declaration and Action Plan on 15 July 2014, the five Heads of State and their teams headed for Brasília for a closed-door plenary session on July 16 with the Heads of State of the Union of South American Nations (UNASUR). As a member nation, Guyana’s President was also in attendance. When you cannot play in the big league, you have to align yourself with other outsiders to build your own competitive team. The team holding the most trophies does not always win the tournament. A unified team, in which all players have equal weight and shared awareness of the evolving whole, makes all the difference for success. Here’s hoping that the BRICS team is just not another team with new heads, playing by the same failed rules and strategies. Cyril, thanks for sharing my post with your followers. Have a great week. Given the human rights and financial instability in some of the BRICKS, I’m wondering if they will be able to establish any real counterweight to influence the established international financial structure. Their stated goals of “peace, security, development, and cooperation” seem to be contradicted by the behavior of most of them. Moreover, it is hard to imagine Russia or China playing second fiddle to anyone if they can possibly help it. We shall see. I agree with your last comment, Dr. Stein. Necessity can forge the most unlikely allies. It has happened before in history. It’s happening now in the Middle East. The funny thing is that such a ground breaking news has gone practically unnoticed in the news. In my view the BRICS will have a great role in the future, readdressing the balance of power and the economic organization of the world. Great article. Thanks. A lot of ground breaking news goes unpublished. The US media is now focused on Ukraine and Israel. Excellent article, interesting how you wove Otto Scharmers’ insight into the article, deep and meaningful. dr. Stien comment on human rights is disappointing. What is human rights” Just a cliche by persons in political food chain to attack other groups or regime. There are mountains of human rights violations in countries leading world bank and IMF.. Even to the extent of committing international murder–Invasion of Iraq. How can these people be concern about growth and development. Blessings to the BRICS. Thanks for your comment, A. It’s very common among humankind to condemn the faults in others that we ourselves possess. I, too, have been guilty of this. You’re right, BRICS has everything necessary to become a weight in the world’s decisions as a whole, let’s just hope it actually works and their ideals remain the same. If given a chance by the Western powers, it could actually work. Here’s hoping they can continue with this much needed cooperation. You can be sure that this development has not gone unnoticed by the US and other advanced western industrialized nations (the G7), as well as the transnational financial corporations, the IMF, and the World Bank.